“Let me just get my wellies off,” says Grainne Kelliher, CEO of Airfield Estate, Dundrum, Co. Dublin. Grainne has just returned from roaming the 38-acre site to check on a calving cow. 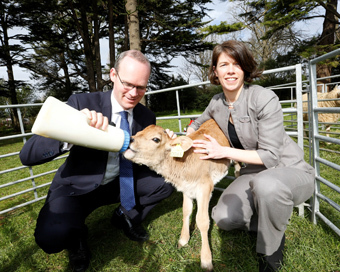 Farm life comes second nature to this CEO as she grew up on a dairy farm in Dingle, Co. Kerry. “We were pretty much self sufficient; we had our own meat, veg and bread. So I’m very comfortable with all those aspects of Airfield. I always loved the farm so it’s lovely to be back!” she says one year into her role. Airfield is a charitable organisation established by the Overend family in 1974 for educational and recreational purposes. The inspiring Overend sisters Leticia and Naomi farmed more than 50 acres, kept a prize-winning herd of Jersey cattle, maintained a remarkable garden and serviced their own motorcars, a 1927 Rolls-Royce and an almost equally venerable Austin. They were also enthusiastic supporters of the children’s charity that has since become the Laura Lynn Foundation. Today it is still a working farm with a Jersey herd, gardens, café and heritage experience teaching visitors about food, farming and the natural world. “We had 200,000 visitors last year,” says Grainne beaming with pride. It is nice to see both CEO and Airfield Estate thriving. On April 9th the team will celebrate the one year anniversary since opening Airfield’s doors after an €11 million revamp. “This time last year it was a building site! So there was a lot of tired faces walking around,” she says. Despite those initial nerves, Grainne hasn’t looked back since. “How many people can say they live in a city but work on a farm?” she laughs. The change of pace in life has been welcomed: “In the corporate world there’s no such thing as office hours, well they didn’t exist in mine anyway. Though this businesswoman has no problem turning the office image on its head, admitting that she has brought her husband and 11-year-old to work on the estate “harvesting green beans”. Aside from the beautiful grounds and nature on site, each week at the Overends café 2,000 customers are served. “We wouldn’t be able to supply everything from the estate so we use local producers to source produce but a lot of our meat comes from the estate. All year round leeks are coming from the estate because we can grow them in our polytunnels and then in the summer we have a huge amount of vegetables making their way to the restaurant. “On a Friday and Saturday night we do a smaller specialised menu and so 80 percent of what’s served on that comes from within Airfield. It’s very much field to fork in a very authentic urban location,” Grainne says. Carrying on the support of the Overend sisters, Airfield still supports the LauraLynn House facilitating charity events and special family days for those it provides care to. Last year Grainne ran the Dingle half marathon with other Airfield team members in support of the charity. Needless to say the Overend sisters are an inspiration to this CEO. “They were women ahead of their time. Even though I never met them I feel I have gained a good insight into the people they were through the archive we have – 20,000 documents (diaries and correspondence) they had stored in the attic,” she says. No pinstripe suits here, just honest to goodness business and education.